Folks, don't be fooled by people who are hell-bent on keeping you living in ignorance, believing in the man-made myth of evolution. If these men didn't see this dinosaur, how and why did they draw these pictures on the rocks? To the right is a picture of a dinosaur fighting a mammoth from the book Buried Alive by Dr. Jack Cuozzo. It was taken by the author in the Bernifal Cave, one of the caverns in France that is renowned for Neanderthal artifacts. The cave has been closed to the public. Science News was given the opportunity to publish the remarkable photo, but declined. It seems that evidence against the prevailing paradigm of naturalistic origin was selected against. It is buried alive by the scientific establishment. As Cuozzo says, this is natural selection in the most literal sense! "Fran Barnes, a recognized authority on rock art of the American South-West, writes, 'In the San Rafael Swell, there is a pictograph [picture symbol] that looks very much like a pterosaur, a Cretaceous flying reptile'..." (Swift, Dennis, "Messages on Stone," Creation Ex Nihilo, vol. 19, p. 20). This figure, about 7 feet long from wing-tip to wing-tip, is actually painted with a dark-red pigment. 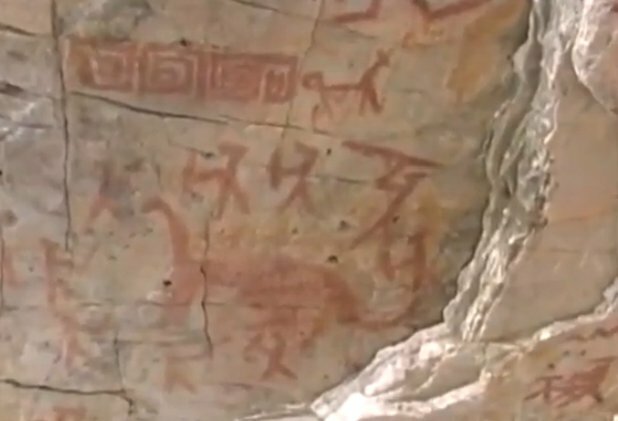 Indians of the Fremont culture are thought to have inhabited the "Swell" between 700 and 1250 A.D. Black Dragon Canyon is named for the pictograph which resembles a large winged reptile with a headcrest. On the left is shown a photo of one of the curious "dinosaur" petroglyphs near Middle Mesa at the Wupatki National Park. This particular petroglyph is called "Puff the Magic Dragon," and appears to be a depiction of a fire-breathing dinosaur. Though there is no certain way to date such petroglyphs, it is believed to be at least several hundred years old. The February 26, 2000 issue of Science News contained an article that commenting on an artifact housed at the Boston Museum of Fine Arts that has come to be known as the Hesione vase (Hesman, 2000). 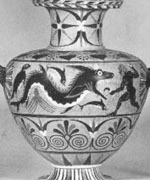 Pictured on this ancient Greek vase is a series of somewhat unusual paintings, including one that portrays a monster that possesses the head of a dinosaur. 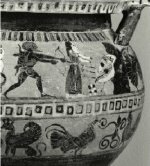 This pottery was created around 550 B.C., and depicts the Greek hero Heracles rescuing Hesione from this "monster of Troy." Forced to concede the amazingly realistic dinosaurian depiction, Science News concluded that the paintings on this unusual vase simply prove that ancient people dug fossils, too. To the left is an urn from Caria, which was located in Asia Minor (Turkey). 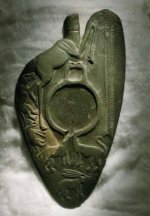 This artifact (described in Thomas H. Carpenter's 1991 book Art and Myth in Ancient Greece: A Handbook) is estimated to be from 530 BC. It depicts what appears to be a mosasaurus with several known sea creatures. The animal behind the sea serpent is a seal, while an octopus is below the sea serpent along with what seems to be a dolphin. The thick jaws, big teeth, large eyes, and positioning of the flippers on this creature match a mosasaurus skeleton very well. Some mosasaurus species also had a narrow cranial crest behind the eye that may have had a fin attached the way it is depicted on the Carian urn. Other artifacts of interest from this region came to light after the deluge and landslide of 1971 in the small village of Girifalco. A lawyer named Mario Tolone began investigating. Tolone asserts to have found dinosaurian representations in this area of Caria with hundreds of other ancient artifacts, of a pre-Greek civilization of Calabria, that is at least 3000 years old. Click here to view a page dedicated to this find. Shown to the left is a terracotta statue measuring about 18 cm long, shaped remarkably like a dinosaur with plates on its back. The plates are triangular, and continue along the back until reaching the tail. 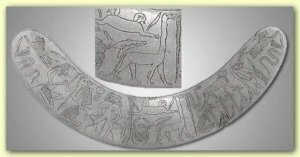 In the view from above (right) the object reveals a strange curving of the plates, as if the animal had been represented in motion on the land. The legs are large and awkward, as if carrying great weight, not at all like those of a lizard. There is also a clear representation of a stegosaurus on a piece of broken pottery. The January 2003 issue of National Geographic magazine presents an artifact described as a "cosmetic palette . . . from a cemetery of the first dynasties in Manshaat Ezzat." These long-necked creatures displayed on page 78 fit the pattern of other ancient dinosaur-like depictions, including arching, muscular necks and stout bodies. Known as the "Two Dog Palette," this artifact depicts many lifelike animals (including a giraffe on the reverse). To the right are displayed slate palettes from Hierakonpolis showing the triumph of King Nar-mer with long necked dragons and an ancient palette depicting a pair of "dinosaur-like" creatures along with numerous clear representations of living animals (taken from p. 93 of Pritchard's book The Ancient Near East in Pictures). The preponderance of these long-necked depictions in ancient art (note also the Egyptian wand depiction) motivated archaeologists who do not believe men and dinosaurs coexisted to invent a name for this particular creature. It is called a "serpopard," supposedly a mosaic of a serpent and a leopard. 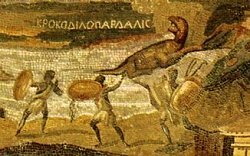 But for those who believe that man was created in the beginning alongside the great reptiles, these palettes seem to be an attempt to depict a sauropod dinosaur. Note the "Four Dogs Palette" with the "serpopard" cut out for clarity. To the right is a Roman mosaic from about 200 AD that depicts two long-necked sea dragons. Paul Taylor, author of The Great Dinosaur Mystery and the Bible, likens them to the web-footed Tanystropheus shown beside. The picture to the right (click to enlarge) was drawn by North American Anasazi Indians that lived in the area that has now become Utah approximately 150 B.C. - 1200 A.D. Even noted anti-creationists agree that it resembles a dinosaur and that the brownish film which has hardened over the picture, along with the pitting and weathering, attests to its age. 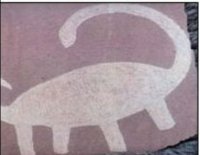 One evolutionist writes, "There is a petroglyph in Natural Bridges National Monument that bears a startling resemblance to a dinosaur, specifically a Brontosaurus, with a long tail and neck, small head and all." (Barnes and Pendleton, Canyon Country Prehistoric Indians - Their Culture, Ruins, Artifacts and Rock Art, 1995.) 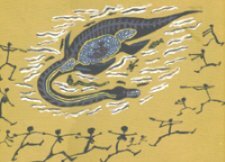 Clearly a native warrior and an apatosaur-like creature are depicted. 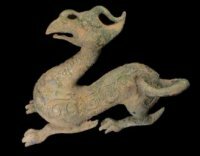 Horned and flying serpent figures are prominent in the mythology of most Native American peoples, often associated with rain and thunder. 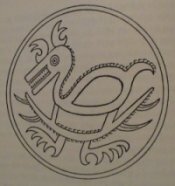 An example is the Algonquin pictograph of a flying serpent known as Mishipizheu. Yet another Native American rock pictograph found in Utah (see left) seems to depict a sauropod dinosaur. Another petroglyph (carved rock drawing) has been found in Arizona's Havasupai Canyon (photo taken by Dr. DeLancy). In the far right picture, Paul Taylor compares this ancient drawing to the Edmontosaurus. There are some clearly ancient engravings in dolerite and gneiss that have been found in Bushmanland, South Africa. Amongst the many depictions, dinosaur footprints, and other artifacts in this region; two are of special interest. One resembles a sauropod dinosaur and the other looks like an attempt to depict a pterosaur. 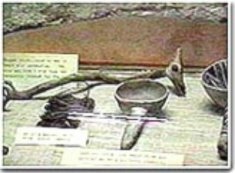 European reports of flying serpent living in Egypt persist through the 1600's. The Italian naturalist Prosper Alpin wrote a fascinating natural history of Egypt in the 1580's. He describes their crest, a small piece of skin on the head, their tail being "thick as a finger," their length being "as long as a palm branch," and their leaf-shaped tail. (Alpin, P., Histoire Naturelle de l'Egypte, tr. by R. de Fenoyl, 1979, pp. 407-409.) All is precisely like modern fossil reconstructions. A French wooden image, dating from the 16th century, also displays remarkable features of a pterosaur. There are two wings that clearly appear to have ribbed membranes rather than feathers. 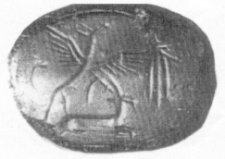 There appears to be a small head crest above and slightly in front of the eyes, the distinctive tail vane, and a hint of the twin skin flap above and behind the bony crest that is quite like the Egyptian seal. 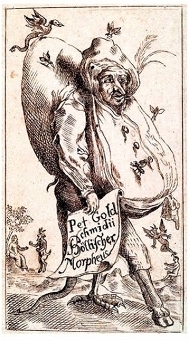 In 1704, Hœllischer Morpheus:Saducismus Triumphatus was published, the theme of this work was the grotesque (including subjects like the occult and black arts). No doubt because the Bible referred to Satan as "that old dragon," dragons are among the creatures often encountered in such works. Within this volume are drawings which depict flying dragons containing actual morphological features of certain species of pterosaurs. On the frontispiece of the work is a clear depiction of a long tailed pterosaur represented with two feet, wings, and a snake-like tail ending in a tail vane. Choir stall railings and misericords (shelf-like seats for reclining while standing) in medieval European churches are often adorned with ornate carvings. 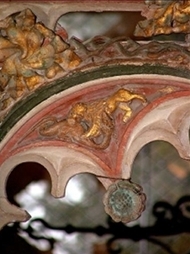 A common theme is the depictions of a dragon (symbolizing Satan) fighting a lion (symbolizing Christ). To the right is one such depiction, showing a dragon that looks very much like a sauropod dinosaur. Iron sculptures made by the Bambara peoples of Mali Africa in the 1800's display a three-horned creature with what appears to be a neck frill. The specimens shown here, part of Genesis Park's collection, exhibit dinosaurian characteristics. One shows top horns pointed forward and the neck frill extending halfway down the animal's back, much like the ceratopsian dinosaur Chasmosaurus. The long tail, squat arched body, and sprawled legs also give it the appearance of a ceratopsian dinosaur. The second, entitled "dinosaurian sculpture," by the exhibiting gallery shows a four-legged creature with a long neck and tail like a sauropod dinosaur. The neck has a slight widening and a ridged frill that makes it a fascinating depiction. Another African tribe from the Mali region is known for producing dinosaurian objects in the mid-1800's . This is the same timeframe when Sir Richard Owen coined the term dinosaur in England. 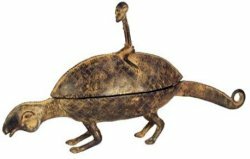 The bronze artifact to the left shows a Dogon tribesman riding a long-necked, long-tailed reptilian creature. 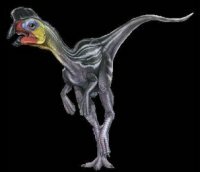 The oddly bird-like head with strong jawline is reminiscent of the "duck bill" on certain Ornithopod dinosaurs. The diamond-shaped pattern on the skin matches fossilized skin impressions discovered on a hadrosaur in southern Utah. In 1924 some Roman style lead artifacts were excavated near Tucson, AZ (see right). 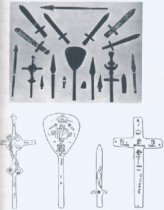 Described on p. 331 of David Hatcher's book The Lost Cities of North & Central America is the unique carvings on these implements, particularly a clear dinosaur depiction on a sword. The Arizona Historical Society still has the sword. A plated and horned creature has also been discovered in Cree Indian art (far left) on the Agawa Rock at Misshepezhieu, Lake Superior Provincial Park, Ontario, Canada. Also to the left is pictured an Inca Ceremonial Burial Stones that is likely from the Nazca culture. In 1571 the Spanish conquistadors brought back stories that there were stones with strange creatures carved on them found in this region of Peru. Today, over 1100 such stones were found by Dr. Javier Cabrera. 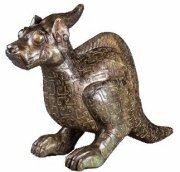 In the early 1930's, his father found many of these ceremonial burial stones in Ica's numerous Peruvian tombs and noted that dinosaur-like creatures were represented on some of them. Retired from the University of Lima, Dr. Cabrera had focused upon validating these finds within the scientific community. His credibility was strengthened by long-necked creatures displayed on pottery in the museum of Lima and beautiful tapestries from the Nazca tombs (ca 700 AD) with a repeating pattern that looks like dinosaurs. 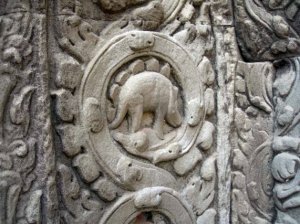 Indeed, the depictions on some of the Ica Stones show the sauropod dinosaurs with a crest of spines much like that discovered by Paleontologist Stephen Czerkas. "Recent discovery of fossilized sauropod (diplodocid) skin impressions reveals a significantly different appearance for these dinosaurs. The fossilized skin demonstrates that a median row of spines was present... Some are quite narrow, and others are broader and more conical." (Geology, "New Look for Sauropod Dinosaurs," December, 1992, p. 1,068.)" 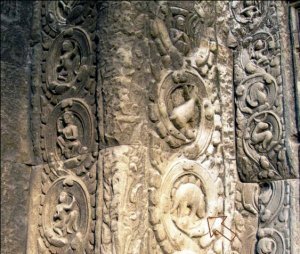 Also, of interest is the fact that the skin of many of the carved dinosaurs has rounded bump-like depictions. Some scientists had pointed to this as evidence that these stones were not scientifically accurate. However, more recent discoveries of fossilized dinosaur skin and embryos have silenced these same critics. For example, Luis Chiappe and colleagues discussed certain sauropod dinosaur embryos found in South America: "The general skin pattern consists of round, non-overlapping, tubercle-like scales...A rosette pattern of scales is present in PVPH-130" (Chiappe, et al., 1998, p. 259). 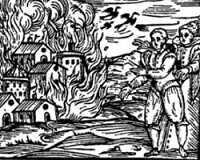 Note the skin depiction above to the left. Not far from the South American Nazca sites are the Moche Indian archaeological locations. These Moche tribes inhabited northern Peru about 100-800AD. Among the artifacts currently in the Lima museum are the Mocha stirrup-spout pots and vases. Their main artistic medium was the red & white ceramic pots, which depict with singular realism medical acts, combative events, musical instruments, plants and animals. In the Larco Herrera Museum in Peru there are vases that clearly depict dinosaurs. 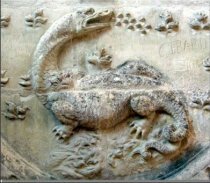 Some of these same types of dinosaurs are shown on the Ica stones, including the dermal frills. The pictures here were taken by Dr. Dennis Swift. In 1945 archeologist Waldemar Julsrud discovered clay figurines buried at the foot of El Toro Mountain on the outskirts of Acambaro, Mexico. Eventually over 33,000 ceramic figurines were found in the area and identified with the Pre-classical Chupicuaro Culture (800 BC to 200 AD). The authenticity of Julsrud's find has been challenged because the huge collection included dinosaurs. In 1954 the Mexican government sent a team of archeologists to investigate. In 1955 Charles Hapgood, professor of Anthropology at UNH, conducted an elaborate investigation including extensive radiometric dating and thermoluminescent testing by the University of Pennsylvania. In 1990 an investigation was conducted by Neal Steedy, an archeologist who works with the Mexican government. Thus Julsrud's work has survived numerous tests and the Mexican government has even imprisoned two men for selling these artifacts on the black market. Moreover, the dinosaurs are modelled in very agile, active poses, fitting well with the latest scientific evidence and lending credence to the artists having actually observed these creatures. Like the Ica Stones, some sauropod's are depicted with a distinctive spinal frill. There was extinct ice-age horse remains, the skeleton of a woolly mammoth, and a number of ancient human skulls found at the same location as the ceramic artifacts, validating the antiquity of the site (Hapgood, Charles, 2000, p.82). Dr. Ivan T. Sanderson was amazed in 1955 to find that there was an accurate representation of a Brachiosaurus, almost totally unknown to the general public at that time. Sanderson wrote, "This figurine is a very fine, jet-black, polished-looking ware. It is about a foot tall. The point is it is an absolutely perfect representation of Brachiosaurus, known only from East Africa and North America. There are a number of outlines of the skeletons in the standard literature but only one fleshed out reconstruction that I have ever seen. This is exactly like it." Further evidence of the authenticity of Julsrud�s finds is the near-perfect Iguanodon dinosaur figurine. This was one of the first dinosaur skeletons discovered. The early concept of its appearance was almost comical in the mid 1800's. By the turn of the century it had improved considerably but fell far short of what we now know. The Acambaro figurine exhibits knowledge we have gained only in the last few years. No hoaxer could have made this model in the 1940's. Here is link where you can read more. Here's another one. To the right is an artifact from Tiwanaku, an important Pre-Columbian archaeological site in Bolivia. Tiwanaku is recognized by Andean scholars as one of the most important precursors to the Inca Empire. 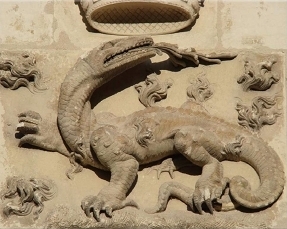 The sculptor depicted a dinosaur-like creature at least 800 years before European scientists discovered dinosaurs. "In the 1960's, a leading jewel designer called Emanuel Staub was commissioned by the University of Pennsylvania...to produce replicas of a series of small gold weights obtained in Ghana. ...So well crafted were they that the animals that they depicted could be instantly identified by zoologists--all but one, that is, which could not be satisfactorily reconciled with any known animal, until Staub saw it." (Shuker, Dr. Karl P.N., In Search of Prehistoric Survivors, 1995, p. 20.) Originally photographed resting on its hind legs (as if bipedal), this enigmatic Ashanti gold figurine was difficult to identify. Once properly positioned, Staub noted that the mysterious artifact bears a striking resemblance to a dinosaur. 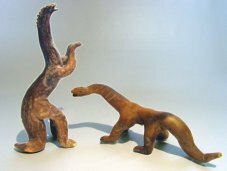 Perhaps this figurine was an attempt to model the sauropod Mokele-mbembe creature that is said to inhabit remote regions of equatorial Africa still today. At a museum in Manitou Springs, Colorado, there is an unusual carved artifact. It is an Indian prayer stick (see below left), roughly a foot long, with a crested head, eyes on both sides, and beaked mouth. The beautiful artistic work stands out as strikingly like a pterodactyl! 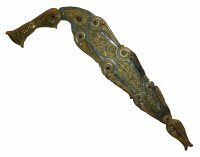 This portrayal from a Saxon shield mount reveals a pterosaur-like creature at rest. The wings are folded back along its scale-like sides, a long beak full of teeth, crest, and an unmistakable tail vane all make the depiction compelling. The wings are folded back along its scale-like sides, a long beak full of teeth, crest, and an unmistakable tail vane all make the depiction compelling.The flying reptile widfloga (or far-ranging flyer) was known to the Saxons and this shield-boss came from the Sutton Hoo burial site. It is displayed at the British Museum (click to enlarge). 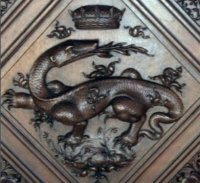 Some of the beautiful French chateaus built at the close of the Middle Ages and early 1500's have dramatic dragon illustrations carved into their walls, ceilings, and furniture. These include Ch�teau de Chambord, Ch�teau de Blois, and Ch�teau Azay-le-Rideau. Note the similarities in the dinosaurian-like dragons and their resemblance to dinosaurs like Plateosaurus and Thecodontosaurus. 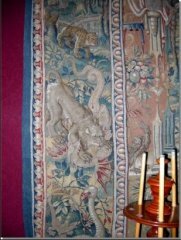 The Ch�teau Azay-le-Rideau also displays a fascinating tapestry depicting what looks like a pterosaur fighting a (click to enlarge). 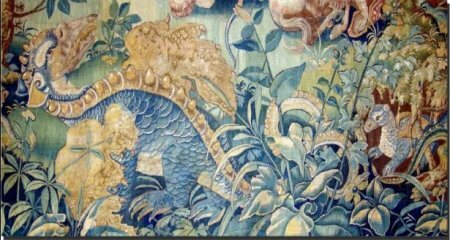 A tapestry at Ch�teau de Blois portrays a dragon (and its baby) with gnarly horns on its head that are reminiscent of the dinosaur Dracorex hogwartsia (click to enlarge). Another pterosaur-like depiction from the Middle Ages is shown in Athanasius Kircher's 1678 book Mundus Subterraneus. This drawing is so compelling that Peter Wellnhofer (The Illustrated Encyclopedia of Pterosaurs, 1991, p. 20.) suggests it might have been based on fossil finds. But it is more likely based on even more ancient reports. 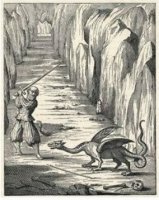 In Kircher's book, the character Winkelried was supposed to have killed the dragon in Switzerland during the earliest days of his particular settlement. The most obvious anatomical discrepancy with pterosaurs (the front feet) was a more recent addition to dragon depictions. G. E. Smith's 1919 book The Evolution of the Dragon explains that ancient notions only included a snake-like body, leathery wings like a bat, and two legs. The front legs were not added till the 16th century. Kircher also includes a picture of a dragon (on left) that resembles the rhamphorynchoid pterosaurs. According to the Greek mythology a heroic figure named Jason, son of Aeson, captured a golden fleece that was guarded by a hissing dragon. 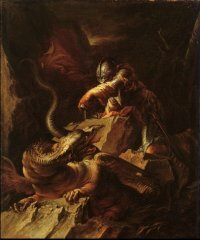 This legend of Jason charming the Dragon is memorialized in a beautiful painting (see left) by the multi-talented European artist Salvator Rosa (1615-1673). It is remarkable in its likeness to a pterosaurian. From where did Rosa get this inspiration? In 1496 the Bishop of Carlisle, Richard Bell, was buried in Carlisle Cathedral in the U.K. The tomb is inlaid with brass, with various animals engraved upon it (see right). 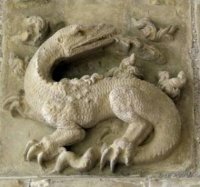 Although worn by the countless feet that walked over it since the Middle Ages, a particular depiction is unmistakable in its similarity to a dinosaur. Amongst the birds, dog, eel, etc. this clear representation of two long-necked creatures should be considered evidence that man and dinosaurs co-existed. One would think that such hard evidence would be highly problematic for evolutionary theory. Indeed Dr. Philip Kitcher, in his anti-creationist book Abusing Science, claims that solid evidence that dinosaurs and man co-existed would "shake the foundations of evolutionary theory." (1998, p. 121) Likewise, Strahler insists that "it is conceivable that a scientist will some day discover human bones among dinosaur bones in such a relationship that it is judged highly likely that humans and dinosaurs lived at the same time. Such a finding would deal a crushing blow to the widely favored hypothesis of a unique evolutionary sequence. In Popper language, the hypothesis of evolution would be falsified." (Strahler, Arthur N., Science and Earth History: The Evolution /Creation Controversy, 1999, p. 17.) Unfortunately the history of Darwinian theories suggests that all such evidence would quickly be assimilated into evolution theory. But one can at least hope that as more evidence comes to light, the credibility of the evolutionary story-tellers will at last wear thin! 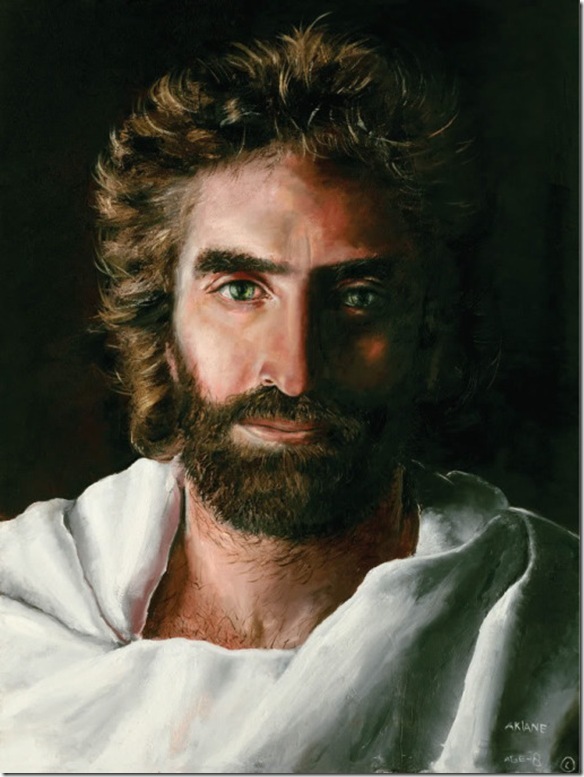 I highly recommend watching the video below after viewing this page, as it presents many other facts and pictures which the evolutionists don't want you to see.